There are 8 reviews of Cologne à l'Italienne. This opens with a lush green note, similar to "Wall Street" by Bond no 9, followed by a complex citrus of petitgrain, bergamot and orange blossom. The green stays on, I'm not sure what note it is. A nice light fragrance for summer...the temps are 90 degree+ the next couple of days, and this will be a perfect scent to wear. This is very beautiful and lasts incredibly well without descending into a generic base like many of the Atelier colognes do. The citrus fades very slowly and it just becomes more delicately herbal. I recently wore it for a long drive and it was a perfect companion (Bois Farine is very good for this too). Institut Très Bien is dedicated to the Eau de Cologne. In 2005 the brand launched three fragrances by perfumer Pierre Bourdon, each a spin classic cologne: Cologne à la Française, Cologne à l'Italienne, Cologe à la Russe. They were not revolutionary and they weren't intended to be. They were, however, excellent. Multiple releases often have one solid perfume and an abundance of wishful thinking. Institut Très Bien bucked the trend and released three outstanding colognes. They are all balanced hesperidic-floral Eaux de Cologne and differ in small but significant ways. l'Italienne highlighted the leafy, woody character of cologne and was more bracing and dry than the other two. La Française was a pitch-perfect, mouthwateringly good cologne. It was an impressive move to make the simplest of the three simply impeccable. La Russe was the cleverest of the bunch. It used a sweet and resinous base to give the cologne both a more stable shape and longer lasting basenotes. Over the years perfumers have worked every angle of the Eau de Cologne formula to make it last longer than the Warholian 15 minutes. La Russe grafts a musky, vanillic accord to the cologne structure. The tradeoff is that Russian is less effervescent than the other fragrances, though still citric. The payoff is a more resolute structure and a greater endurance than either La Française or l'Italienne. The base's hint of powdered leather makes it seem like a less animalic descendant of Eau d'Hermes. A decade later in 2015, Institut Très Bien added a second trio to their line: Les Colognes Fines (as opposed to simply "Les Colognes"). Where each of the Colognes emphasized one particular aspect of the classic Eau de Cologne, the Colognes Fines, as their specific names reveal, supplemented cologne with an additional note. Each fragrance has a direct predecessor in the 2005 Colognes. They don't smell alike per se but they are similar in concept. To the brand's credit, they don't seem to have employed the flanker strategy of taking a stock base and simply added different 'flavors' to it. Instead, each cologne is reshaped in light of its new note. The notes themselves (rose, violet leaf, tuberose) are quite apparent, particularly in the top notes, and deserve to be spotlighted in the perfumes' names. Violette de Parme (L'Inattendue-unexpected) is the most contradictory of the three. It's not that the accords don't work, but it varies the most between the strip and skin. On paper, it is clearly defined at all times and is the sharpest of the three. The top note is a deliciously old-fashioned candied violet. Cut from the 19th century to the 1970s: the metallic-green heart is reminiscent of the hissy 'functional' violet leaf of Grey Flannel. The transition is unexpected but logical. The pastille topnote and the urinal puck heartnote are both functions of violet leaf aromachemicals. Of the three, Violette de Parme best transposes the bracing, invigorating nature of classic Eau de Cologne to a new structure. The chilled soapy basenote is a nimble end to the interesting journey, a bit like sticking the landing after a pyrotechnic vault in gymnastics. Oddly, for the cologne with the clearest play on paper, on skin the dynamics don't come through nearly as strongly. Same shape, blurrier focus. In Rose de Mai and Violette de Parme, the added notes energize the cologne structure and lights it up. Tuberose Absolue swallows the Eau de Cologne whole. Its label is "La Flamboyante." (Do I need to translate?) Imagine a contest between classic Eau de Cologne and Amarige. Who do you think wins? Imbalance is tuberose's not-so-secret weapon and the perfume gets high marks for taking a risk and succeeding. The cologne framework does soften the impact and highlights the soft rubbery side of the flower. It buoys the tuberose giving a hazy chiffon blur similarly to the way the lemony topnotes of magnolia aerate flower. In a contest of endurance, tuberose beats any other note in the Cologne. The basenote is 90% tuberose, but having been filtered through cycle of the Cologne it is less strident than the beautifully jarring topnote. Adding individual key notes to an underlying Eau de Cologne structure goes back to the violet, heliotrope and lilac Eaux of the late 19th century. More recently, Atelier Cologne built a brand on a version of the tactic. But a better comparison for the ITB Colognes Fines are the Hermès colognes such as Gentiane Blanche, Mandarine Ambrée and Rhubarbe Ecarlate. Like those from Hermès, the ITB colognes lean more toward refinement than simplicity. All six fragrances in the line are presented in eau de parfum concentration. (At the launch of Rose/Violette/Tuberose, the original trio received free upgrades from edc to edp.) Don't let the concentration fool you---all three are colognes at heart and give a concise, brief showing on the skin. I wrote my characterizations of each of the Colognes Fines before I saw the nicknames at the ITB site. My observations lined up with the brand's descriptions, not indicating any particular observational skill on my part. Rather, it points to the clarity of the design and how well the fragrances translate their intent to scent. Apparently in 2009 Institut Très Bien closed, though not permanently. At some point, the brand was revived and 2016 marks an expansion. The increasing frenzy of perfume releases makes me wary and I'll admit to an inward wince when I saw that Institut Très Bien were to double the number of products in their line in one shot. But then again, maintaining a line of three product during the most cynical years of perfume ambition and expansion is laudable. The brand clearly stand behind their product and The Colognes Fines do nothing to diminish the brand's integrity. 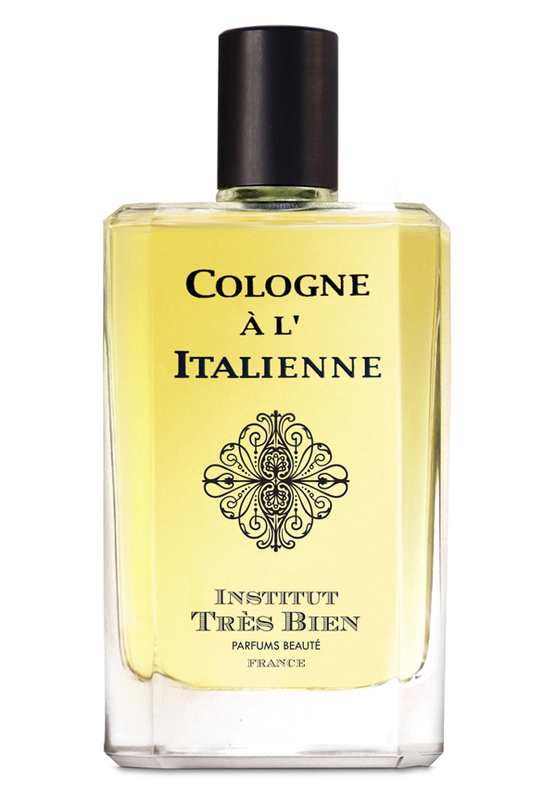 According to their web site, Institut Tres Bien's Cologne a l'Italienne is "an intense accord of fresh head notes — lemon, citron, bigarade orange, bergamot, and sweet lime — giving way to an aromatic, herbaceous heart — Petitgrain, orange blossom, lavender, rosemary, verbena, and maté — with a discrete amber drydown — iris and benzoin." On me it is a dry orange cologne, as their a la Francaise was based on lemon. Italienne is a drier cologne than the sunnier Francaise, perfectly decent, but nothing special. Since my review of Francaise, when I mentioned that their three colognes were out of production since 2009, there has been a change on their website. The three scents are back, named "Cologne" but sold in "EDP" strength. Go figure! At 90 euros the bottle, I'm going to stick with much less expensive citrus-based colognes, which abound by the dozens. It's not the rocket science formula of perfume history and it's hard to get any variation on this formula "wrong," though I have come across a few that try valiantly to do just that. If you have money to burn, Institut Tres Bien may be just what you are looking for. Jemimagold and Asha have given extremely accurate detailed descriptions of this cheerful cologne. The only point I wish to add is regarding the iris note...it is presented with a light hand, which adds just a hint of powder to this blend, I find it quite clever. Bourdon has turned out an excellent composition! There are no member images of Cologne à l'Italienne yet. Why not be the first?